MM Solar Advisory | Take control, cut costs and add value with risk-free, turnkey solar solutions. If you are thinking about and want solar power for your business, there is no longer reason to wait. Your community wants it now. Your stakeholders want it now. The analysis and decision-making to implement solar power on your property is straightforward. You don’t need a task force. You don’t need an implementation team. You don’t need lots of time – hours, not days/weeks. Once you decide to do it, the solar installation will have almost no impact on business operations. Your employees won’t be displaced or disturbed – it’s outside, on the roof or the ground! Your customers and suppliers won’t be inconvenienced. Nobody has to be trained or retrained for it to work. Getting your money’s worth out of your solar project is simple and virtually assured. You can use low-cost financing with $0 down. Savings vs grid-purchased power starts in year 1, continues for decades. You will get tax credits (30% year 1) & other tax deductions in first 6 years. Your building becomes more valuable, either to tenants or buyers. BRAND VALUE. In today’s economy, all company stakeholders – employees, customers, vendors, investors, neighbors – want to see sustainable business operations that have material impact and will support and applaud such executive actions. Reducing waste is good for business: on-site solar power is good for business instead of buying ever more expensive grid power that is financially and environmentally wasteful. LEAD. 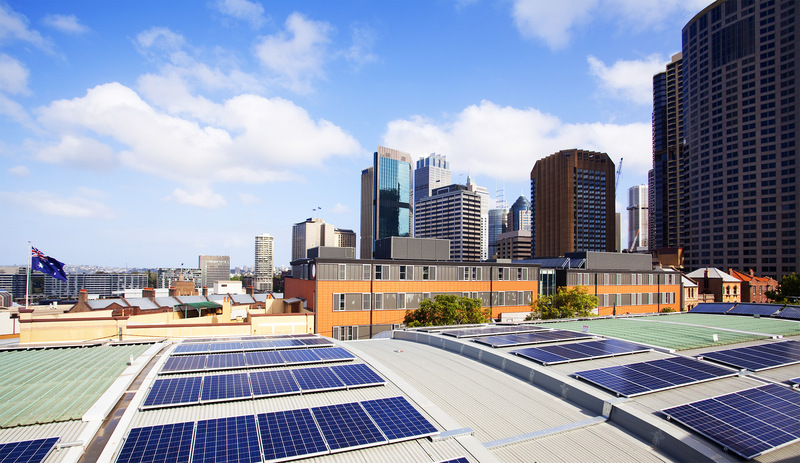 You have the opportunity to display hard evidence of your smart, substantive and strategic leadership in your company, in your city, in your industry by deploying high-impact, low-risk solar on your property. Join the multi $B US corporate solar market that includes leading American companies who already harvest significant value from on-site solar projects. You will be in great company! FUTURE. The transformation to distributed energy generation is well underway as many leading US companies have installed solar on their buildings. Solar is already contributing $84B to the US Gross Domestic Product (GDP) according to The Solar Foundation 2016 Economic Impacts Report. Additionally, solar job growth rate exceeds all other business sectors and currently employs over 260,000 Americans. Start heading toward the power future TODAY. PROVEN. Albert Einstein won the 1921 Nobel Prize because of his research on the photoelectric effect (basically converting sunshine to electricity via silicon). Since then, industry and governments worldwide have been improving solar via massive global production, demand and deployment of solar technology. Solar is experiencing a better/faster/cheaper innovation curve similar to that of the information technology field. POPULAR. Crazy off-the-charts popularity: The Pew Research Center 2016 survey finds almost 90% of Americans favor expanding use of solar power. We do this together and work efficiently. We get to know you and your sustainability goals. We give you unbiased and trusted advice. We show you how you will enjoy sustainable savings, non-perishable benefits. We show you how leading and moving first is not risky and will yield great value for you. We tailor the solution based on your power usage. We create a finance plan that is best for you. We design and install the solar power system. We celebrate the first step in your on-site power strategy. WHY WAIT? LET’S GET STARTED.